The questionnaire will provide both parties with insights into the possibilities of a future partnership. It will determine whether you are the right fit for ADMC and whether you feel you want to start a partnership with ADMC. 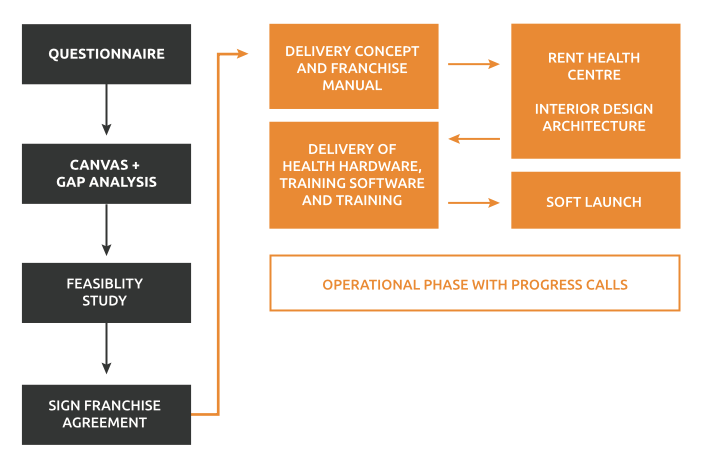 After the questionnaire phase it is time to analyse your franchise plan. This includes a feasibility study of the business plan and gap analysis to determine what still needs to be achieved in order to implement the plan. After agreeing upon the franchise terms, the actual planning will start. The concept and manual will be delivered. You can find a location for your centre and hire staff. The ADMC corporate identity will be incorporated into the design of your health centre. After all hardware and software is installed and training is completed, it will be ready for the soft opening.